Heinz Field – We Brought Our “A” Game! Heinz Field… known as the most sacred football stadium in all of Western Pennsylvania, also hosts many other special events and yes, even weddings, each year. This was a fairytale wedding. In the planning stages for over a year, there was no detail too small to be overlooked. The wedding date could not be cast in stone until the 2016 Steeler schedule was set! And there were a number of direct connections to Heinz Field and The Steelers. Our up-lit chiffon pipe and drape framed the ceremony area. Elegant and understated. Black & White, with red accents were the colors chosen. A four piece string quartet provided music for both the ceremony and the cocktail hour. All very, very elegant. Our Bride, Elena, carried a large bouquet of all creamy ivory Vendella roses, with lots of sparkly accents, matching the sparkling tulle on her dress. The bridesmaids, dressed in formal black gowns, carried hand tied red rose bouquets. The gentlemen wore coordinating rose boutonnieres. As the ceremony was nearing completion, the cocktail area was quietly opened. While the bridal party and families were taking formal & family pictures, friends and family members enjoyed cocktails and a variety of yummy treats. At 7PM the final “Reveal” of the reception area took place. 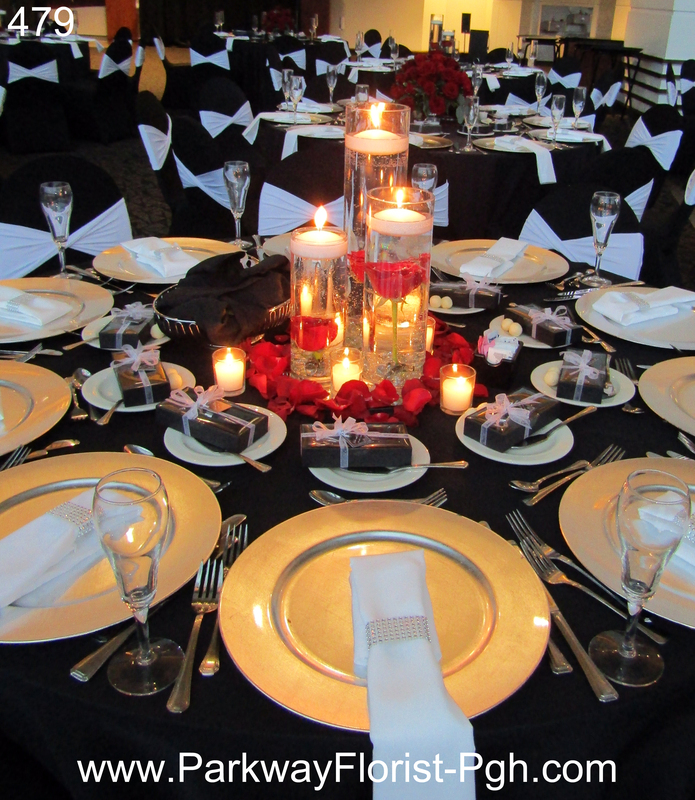 Guests were welcomed to their beautifully adorned tables, which were covered with black linens, silver charger plates, white napkins, beautiful red rose centerpieces… and lots of candle light. 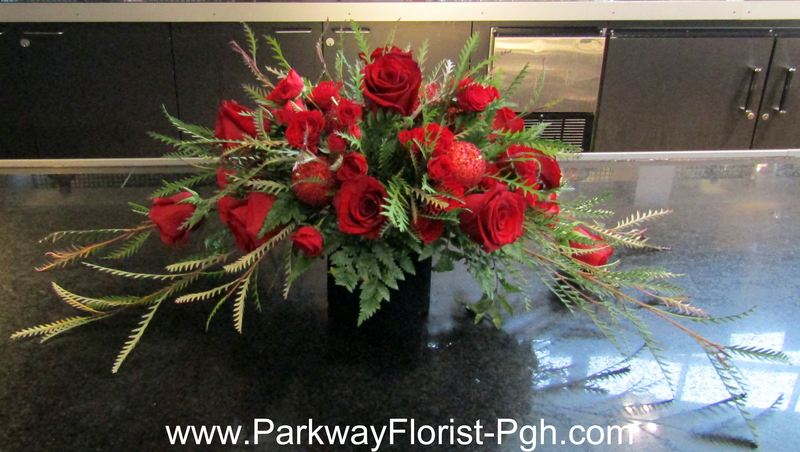 Flowers and candles were reflecting in the Heinz Field windows as dusk turned into darkness, and the real party began to unfold.. 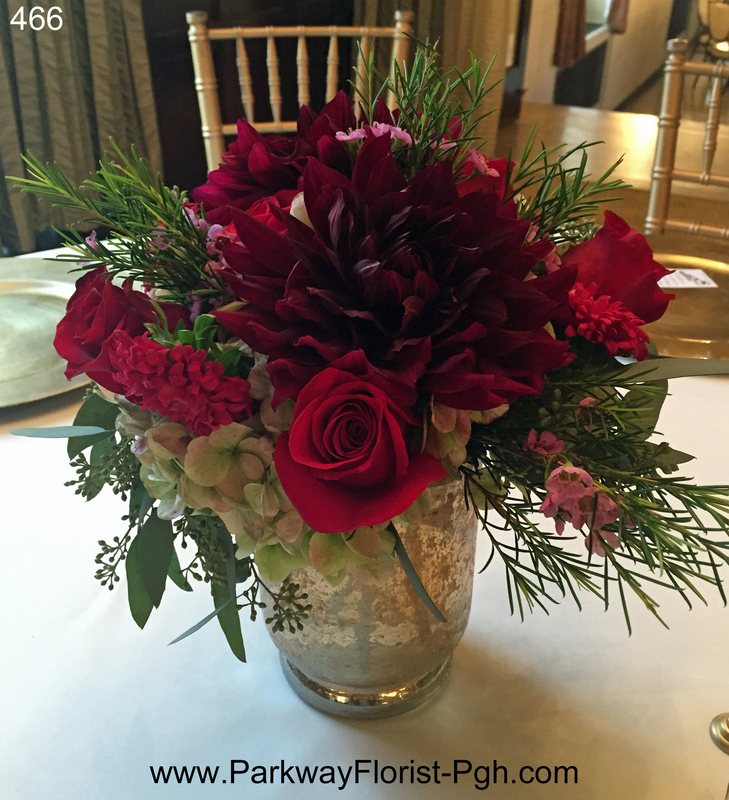 Bridal party flowers as well as red rose centerpieces adorned the head table. Moio’s Bakery provided a tasty wedding cake, which the bride chose to leave understated. Her cake topper initials sparkled from every angle. Following a wonderful dinner, dancing began in earnest, and continued all night. As the clock struck midnight, our very happy newlyweds made their exit to a downtown hotel bridal suite. 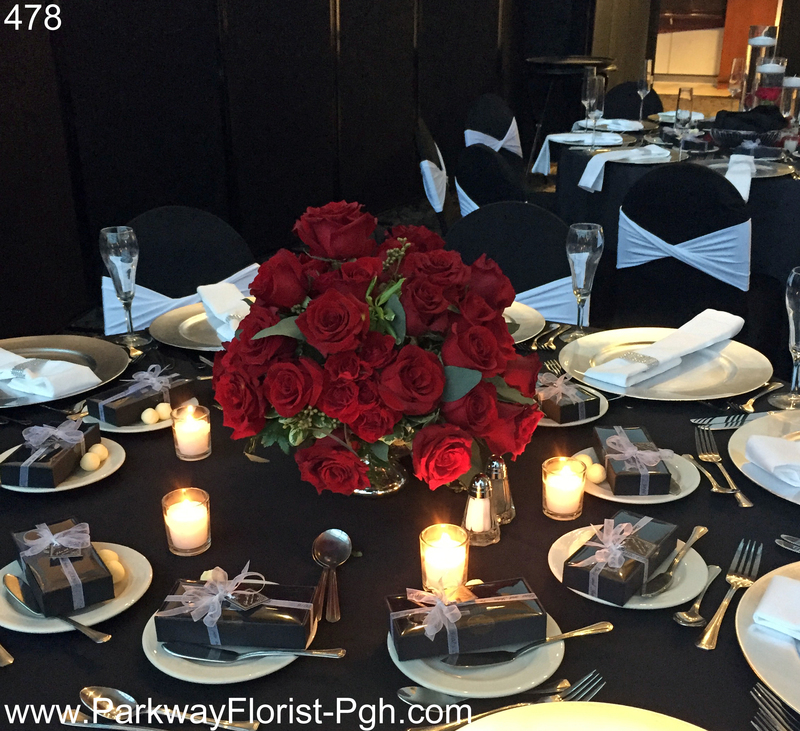 We and the Heinz Field event staff began to dismantle the wedding décor and prepare for the Steelers’ Sunday football game. Oh… and the Steelers brought their “A” game on Sunday also. Win-Win-Win! To Elena, John, and your families, Thanks very much for allowing us to be part of your special day. We wish you lots and lots of happiness always. It was truly a pleasure to work with you. And Merry Christmas to everyone! This entry was posted on December 11, 2016, in Weddings - 2016. As our wedding season moves into November, we are focused on finishing out 2016 season on a strong and proud note. This past Saturday we had two weddings which led us from the central city to the suburbs to the countryside. Our first wedding was at Heinz Memorial Chapel on The University of Pittsburgh’s campus. We provided two arrangements for the altar of the chapel, which the family transported on to the reception, following the ceremony. We also provided the bride and bridesmaids bouquets, boutonnieres and corsages. The bridesmaids wore a dark marine blue short dress & the color scheme was white with red and blue accents. The flowers were designed to coordinate. The bride carried an all white bouquet containing white and ivory roses, garden roses, and lisianthus with eucalyptus as greens. 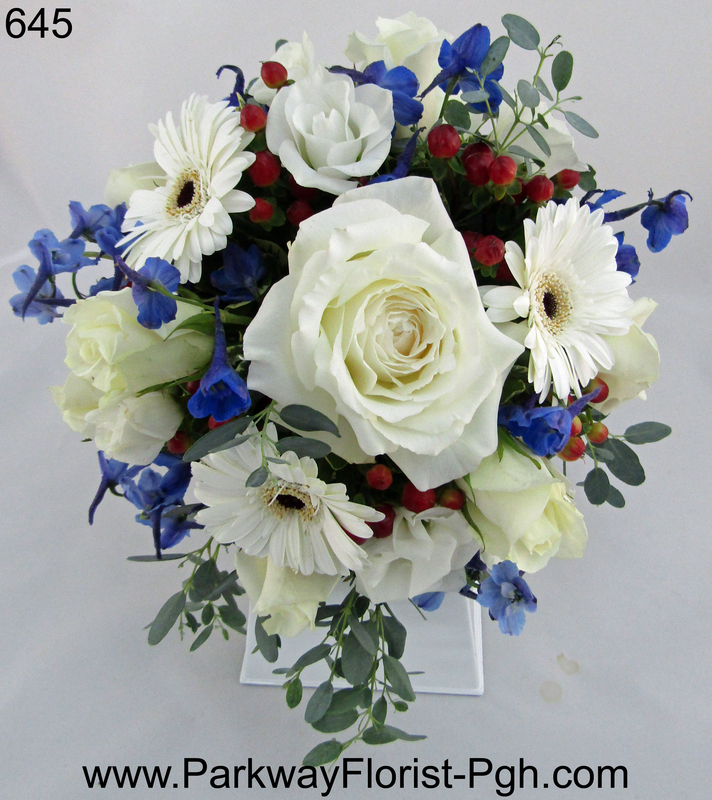 The eight bridesmaids carried white roses and gerbera daisies, blue delphinium, and red hypericum berries. Heinz Memorial Chapel, in the heart of Oakland, is an iconic ceremony location. There are endless photo opportunities throughout Oakland which is partially what draws so many couples to get married there. 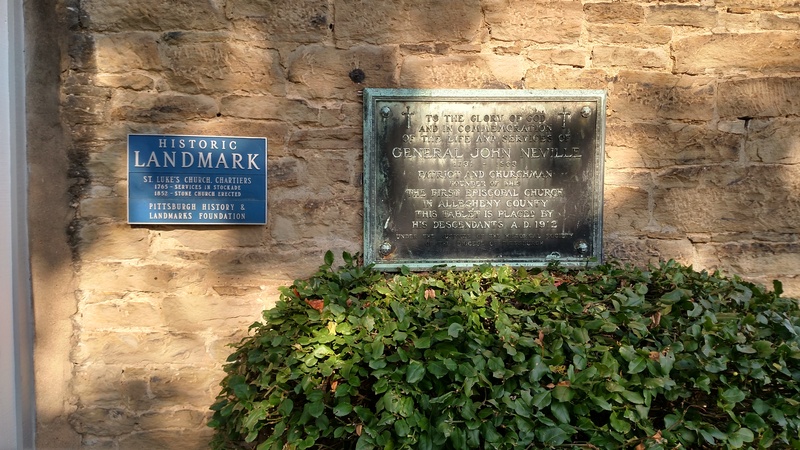 (As of January, 2016, a University affiliation is no longer required to be married at Heinz Chapel. There is a discount offered if you are affiliated with Pitt or UPMC). 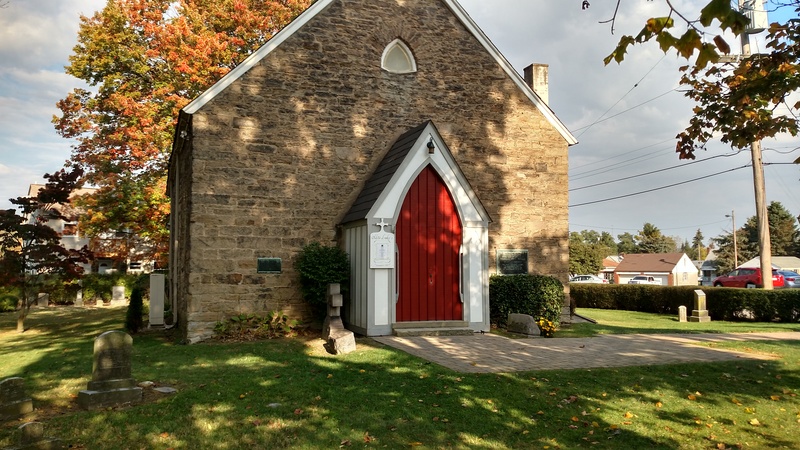 Our second wedding for the day took place at St. Gabriel of the Sorrowful Virgin Church in Whitehall, PA. With another large bridal party, (8 bridesmaids, 8 groomsmen, several ring bearers and flower girls) we were up to the challenge of coordinating this ceremony. Despite a few technical difficulties with getting the limo bus into the church’s parking lot, the ceremony went smoothly. Our bride waited till the very last second to let her father see her (he was joyfully teary-eyed) carried a bouquet with white/ivory roses, peach spray roses, and gold accents. It was a classy and romantic bouquet, with lots of interest. 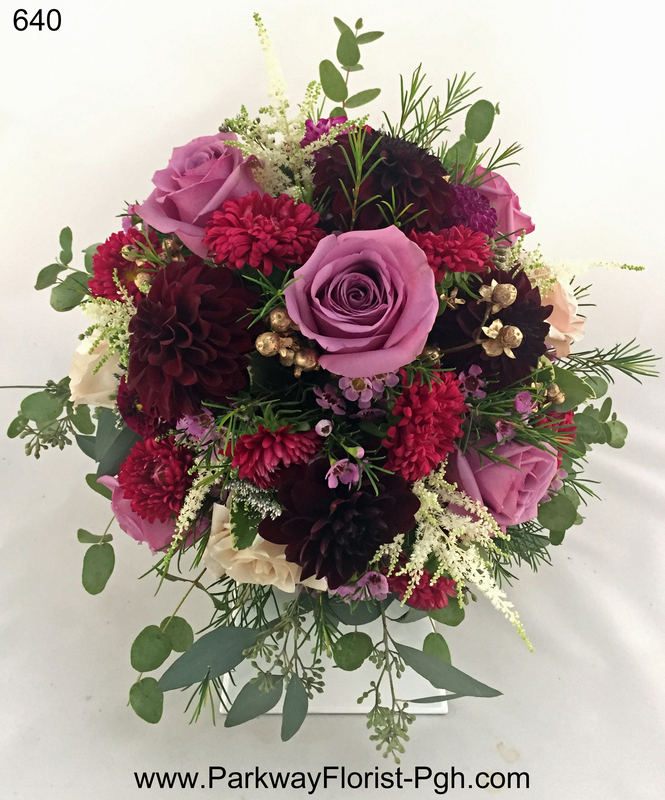 Her bridesmaids wore dark maroon dresses which were accented by peach roses, maroon dahlias, (some of the last of the season) white mums, and gold assents as well. 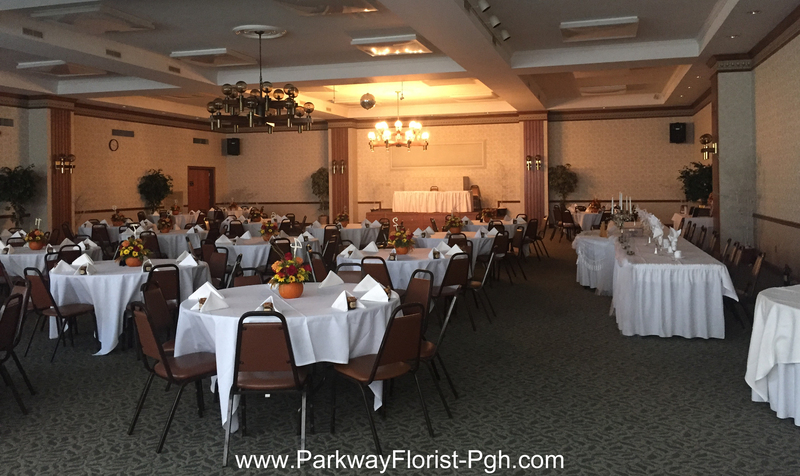 We then continued on to the reception, which took place at The Willow Room in Belle Vernon, Pa. While the room was being quickly transformed from an event earlier in the day, we got our trucks unloaded and all of our supplies transported to the ballroom on the fourth floor. The centerpieces consisted of several separate elements which meant that they needed to be assembled onsite. The finished product (pictured below) left romantic ambiance in the room, especially once the candles were lit. As our year is nearing the end, , we are already starting to look back and reflect on all of the beautiful weddings that we were honored to a part of this year. . Of course there are many busy days to come with the holidays right around the corner. It is always a new day and a new challenge that we look forward to. Best wishes to all of the families we have been able to help. We are looking forward with great anticipation to what 2017 will bring our way. Thanks to our readers for sharing and enjoying our stories and posts each week. 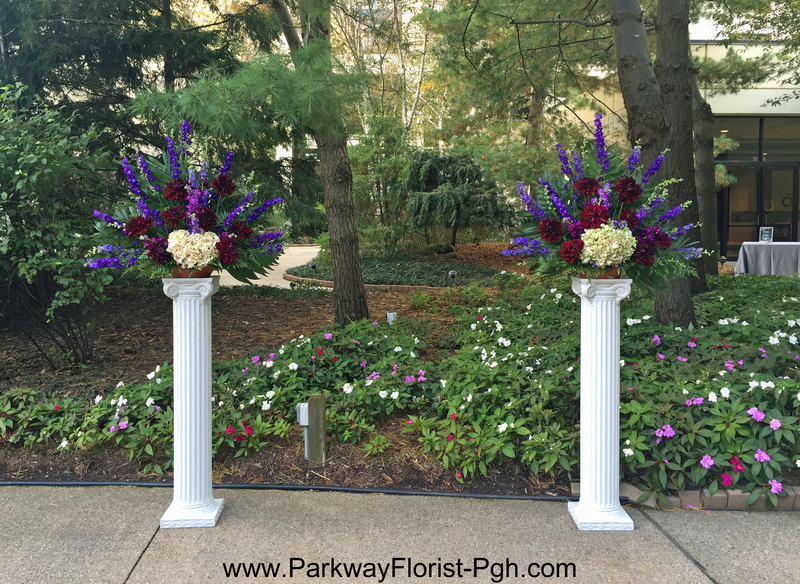 This entry was posted on November 7, 2016, in Weddings - 2016 and tagged bride flowers, bridesmaids, church wedding, dahlias, fall wedding, Heinz Chapel Wedding Flowers, november wedding, Pittsburgh Wedding, pittsburgh wedding flowers, red white and blue wedding, Roses. Style and Tradition – Mazel Tov!! Tradition & Customs often plays a very important in weddings & wedding planning. We work very hard to help our brides and grooms incorporate the traditions & customs that are important to them and their families, while providing the feel or dream that they want to achieve. At times, this can mean some research into what the traditions and customs are. Sometimes, it involves conversations with a number of relatives to show us pictures, or share other information that may be helpful to our process. 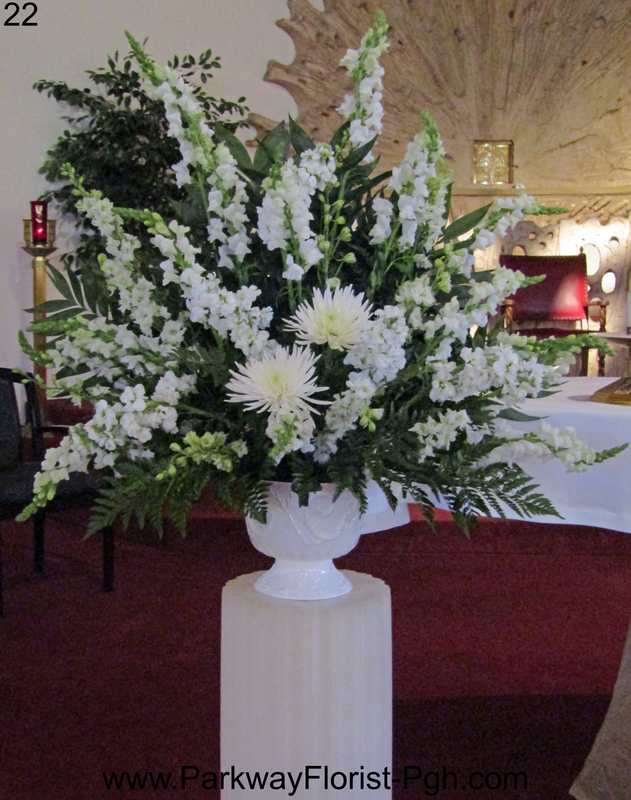 The heavily petalled center isle meant that the ushers used the side isles to seat guests. The center isle was reserved the wedding processional. Steven Vance Strolling Violins provided ceremony music and night was off to a great start. The bride carried a bouquet of White Mini Cymbidium Orchids, Fuchsia Dendrobium Orchids, Lavender Ocean Song Roses, Ivory & White Roses, and Purple Wax Flower accents . 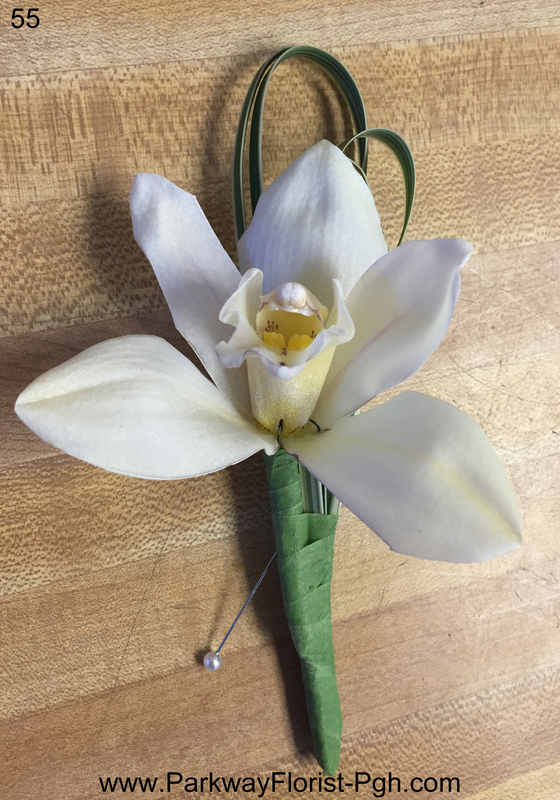 The Groom wore a matching white mini cymbidium orchid boutonniere. 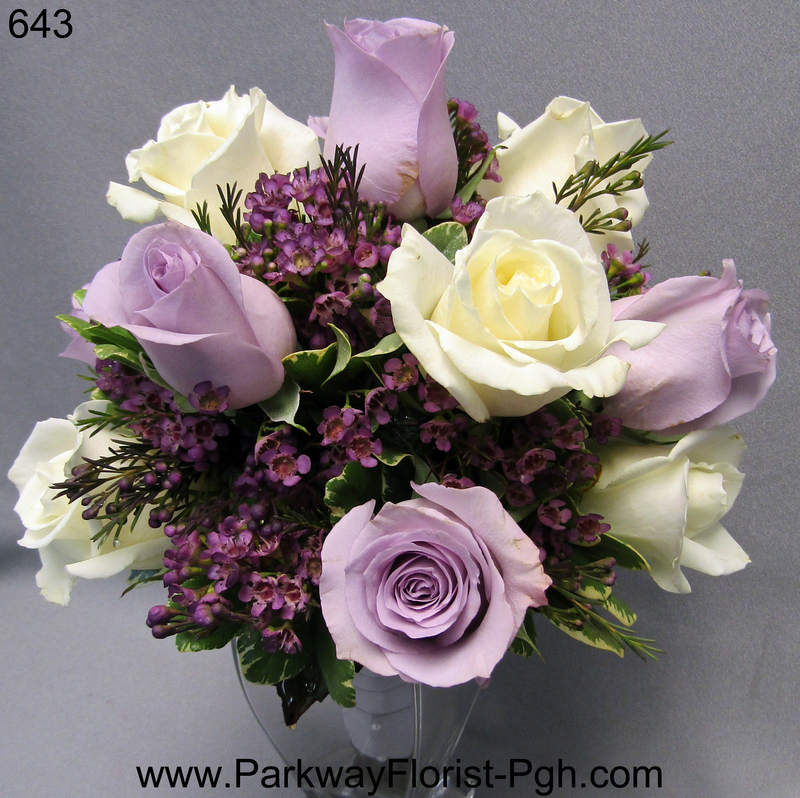 The bridesmaids carried lavender Ocean Song Roses, Ivory Roses, and Purple Wax Flower. 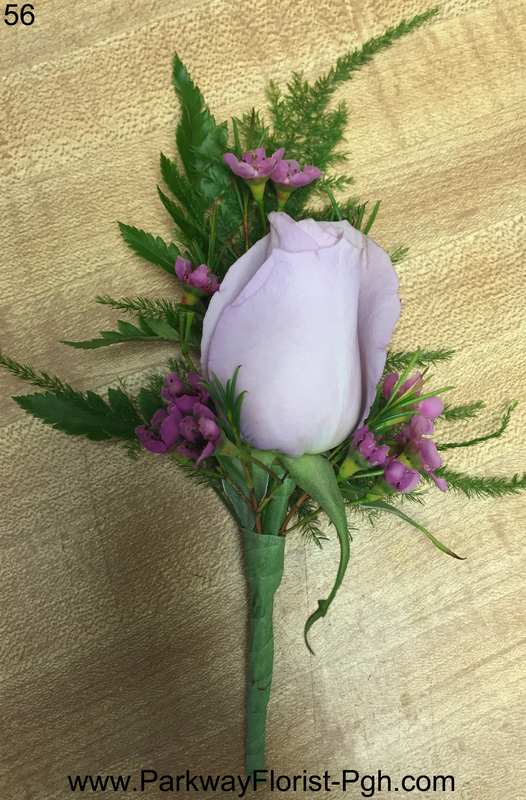 The Groomsmen wore matching Lavender Ocean Song Rose and Wax Flower Boutonnieres. 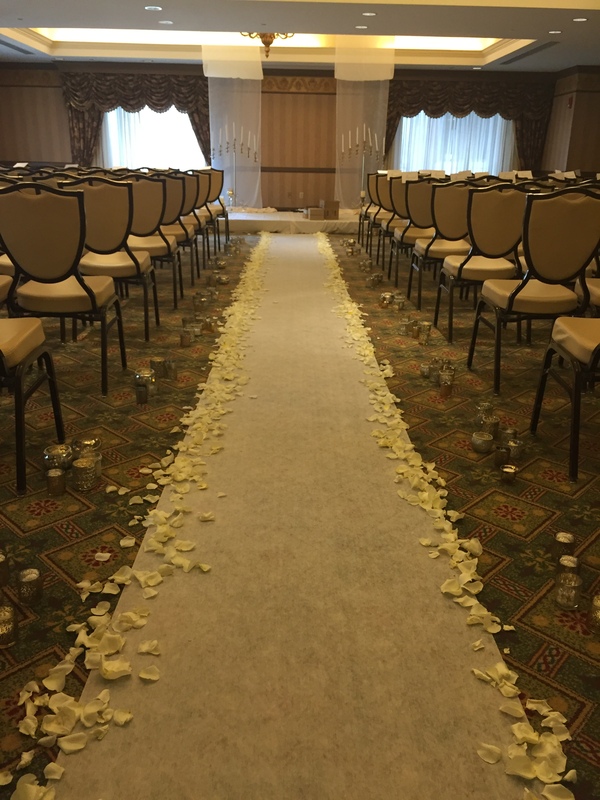 The Chuppah was decorated with bands of white hydrangea that were used as tiebacks to the sheer fabric drapes. Following the ceremony, the guests proceeded to the cocktail hour while the bridal party had portraits taken in front of the Chuppah. We then began to flip the room for the reception. This all happens very quickly and with careful precision. 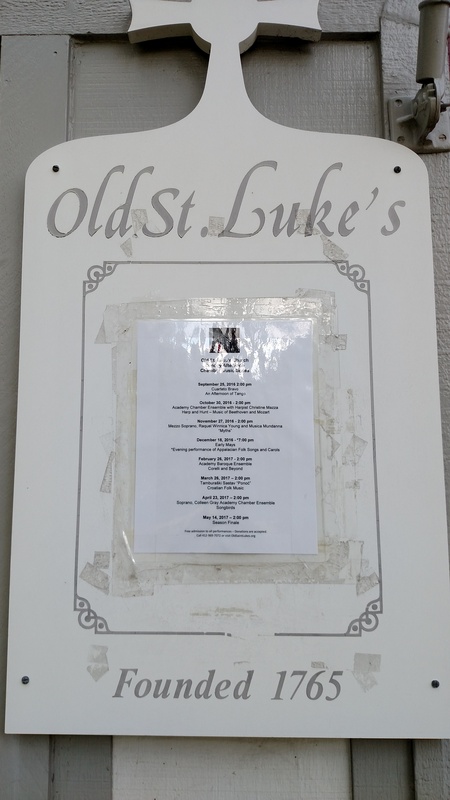 Tables and chairs are put in place, the Chuppah is removed, a dance floor is assembled, The DJ sets up, the centerpieces are perfected, the wait staff readies the tables, lighting is adjusted, and so much more that happens in the blink of an eye. 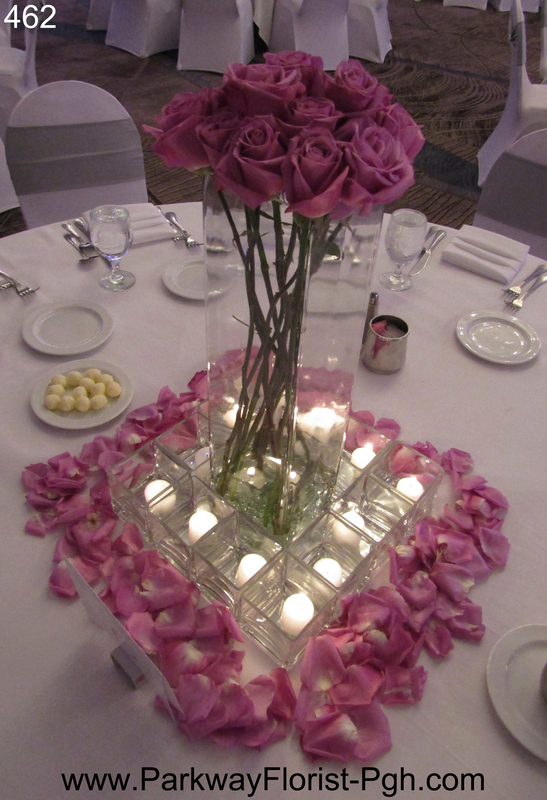 The centerpieces also utilized rose petals to create more ambiance. 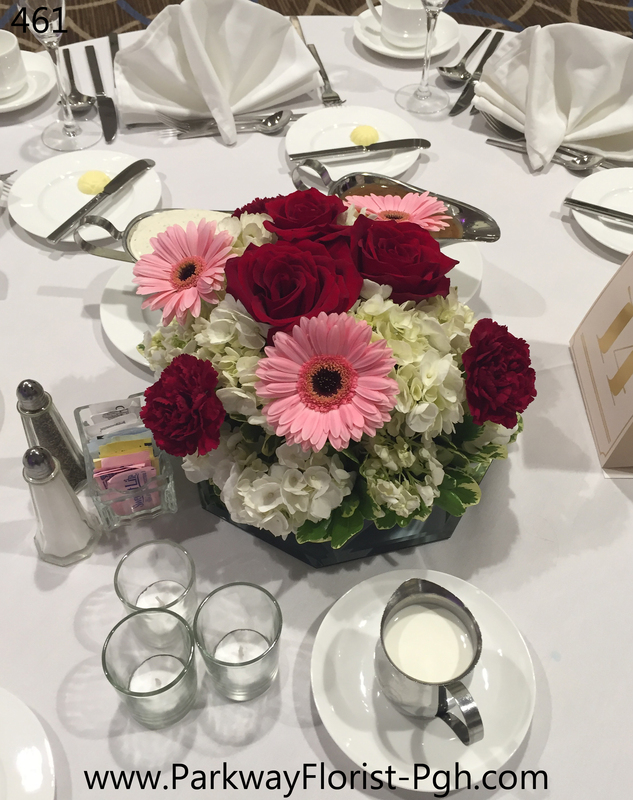 Two slightly different centerpieces decorated the guest tables. The first used a tall square center vase of white hydrangea with twelve square votive candles around it, and rose petals on the outside. The second used a tall square center vase of lavender roses that matched the petals. 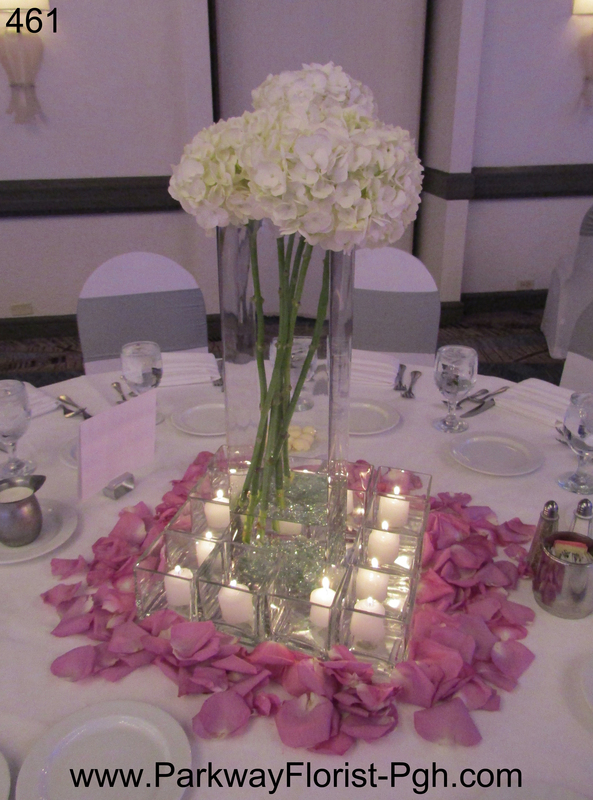 The centerpieces created a romantic glow throughout the evening. The head table was our favorite King Arthur styled table, also decorated with rose petals, and utilizing the bride and bridesmaids bouquets. Additional tea light candles added interest. At the conclusion of the cocktail hour and pictures, guests were welcomed back in for the reception. The room again made a stunning impression. The two families, now joined as one, danced into the late evening celebrating the lovely occasion. We rose to the challenge to incorporate tradition and customs, with contemporary styling into this wedding. All of our hard work and long hours resulted in a dream wedding for Stephanie and Elliott. Best wishes to you both, Mazel Tov! Thank you for choosing our company to help make your dream come true! 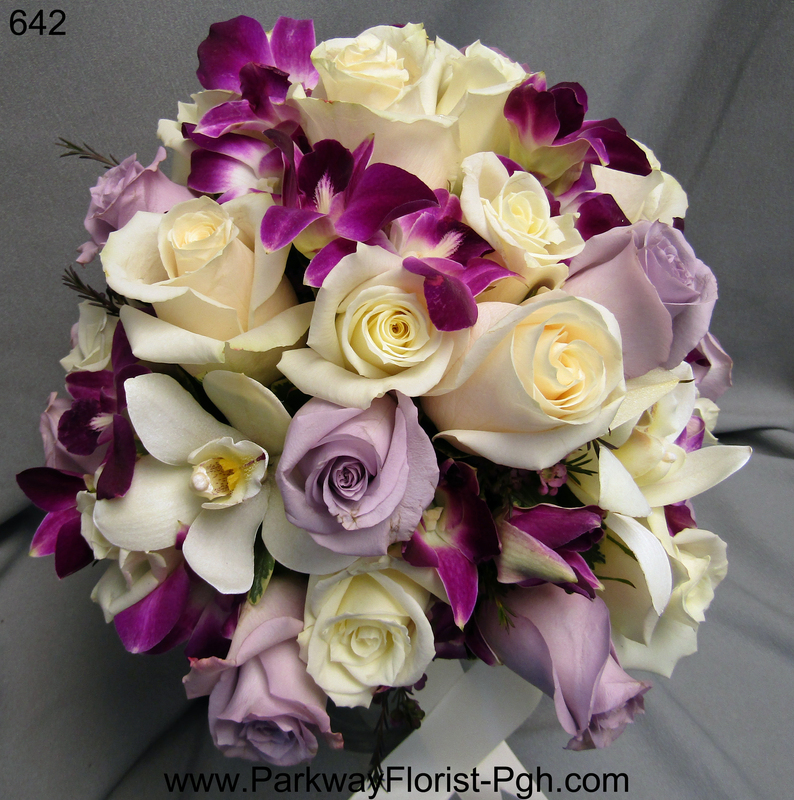 This entry was posted on November 3, 2016, in Weddings - 2016 and tagged bride bouquet, contemporary wedding flowers, flowers chuppah, hotel wedding, jewish pittsburgh wedding, jewish wedding chuppah, jewish wedding flowers, lavender wedding flowers, orchid bouquet, Pittsburgh Wedding, pittsburgh wedding flowers, Roses, wedding bouquet, wedding chuppah, wedding orchids. 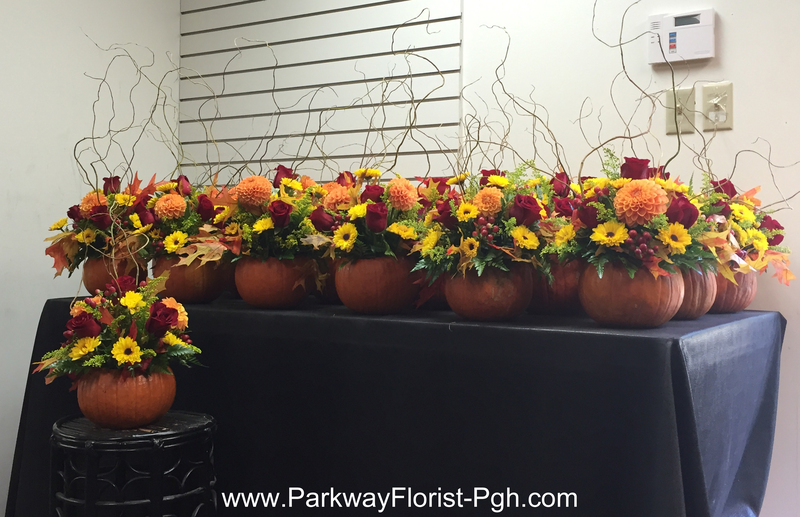 Very early on Saturday mornings, before the sun begins to rise, our day at Parkway Florist begins. As we start pulling together all the pieces and parts for the days’ events that go to multiple locations, we are like Santa’s little elves, always checking our list twice! 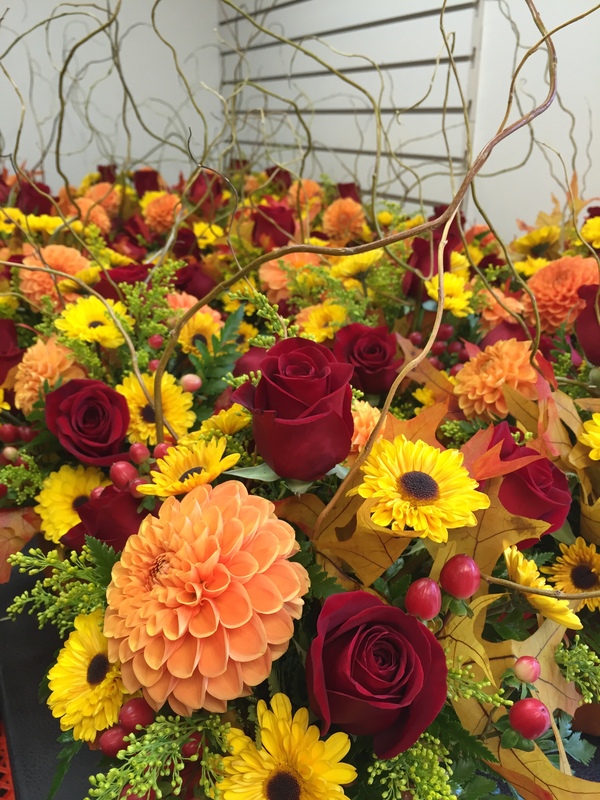 The accompanying glorious fall bouquets were delivered in mid afternoon to Old St Luke’s Church in Scott Twp. 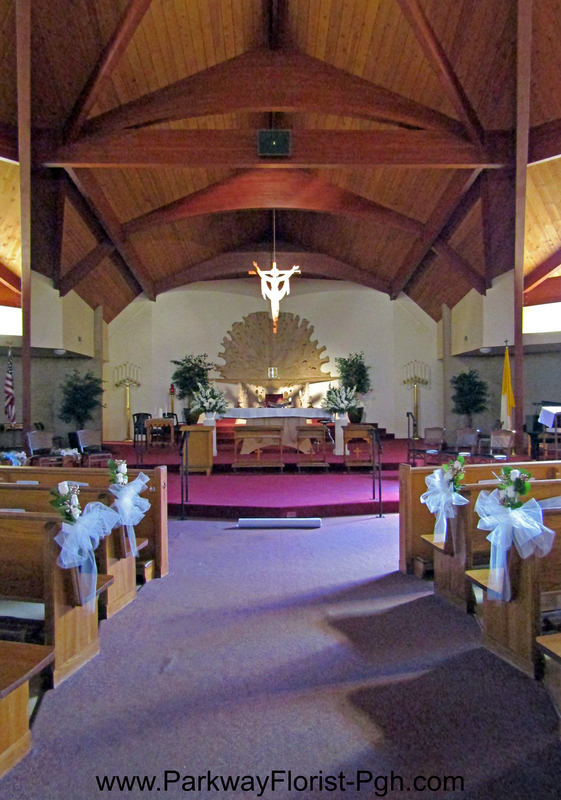 A long & low centerpiece was used on the altar at the church, and then was taken onto the reception & used on the head table. 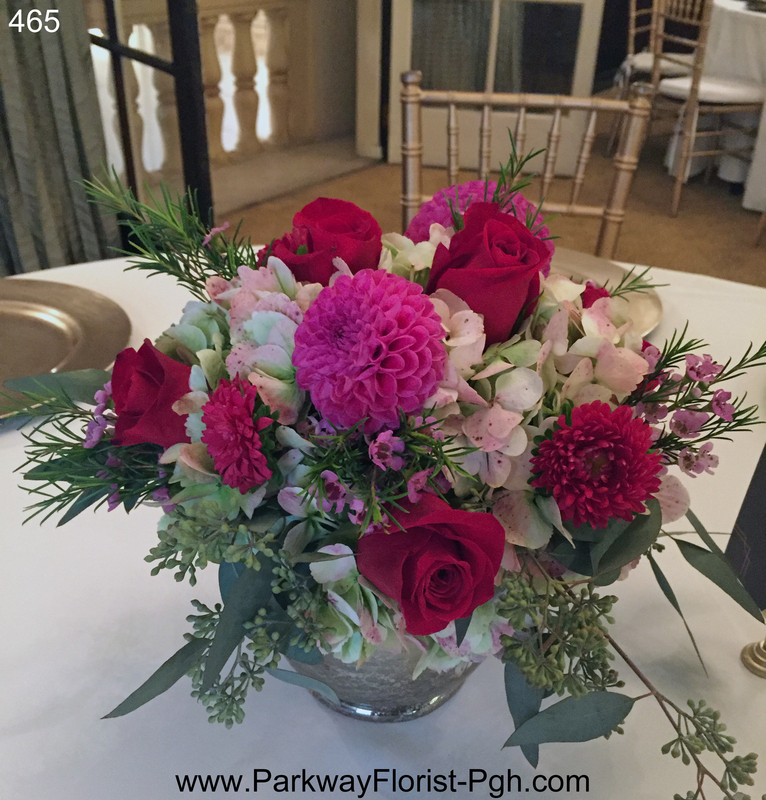 Our second stop of the day involved bouquets and centerpieces being delivered to the mezzanine level of the Omni William Penn Hotel. 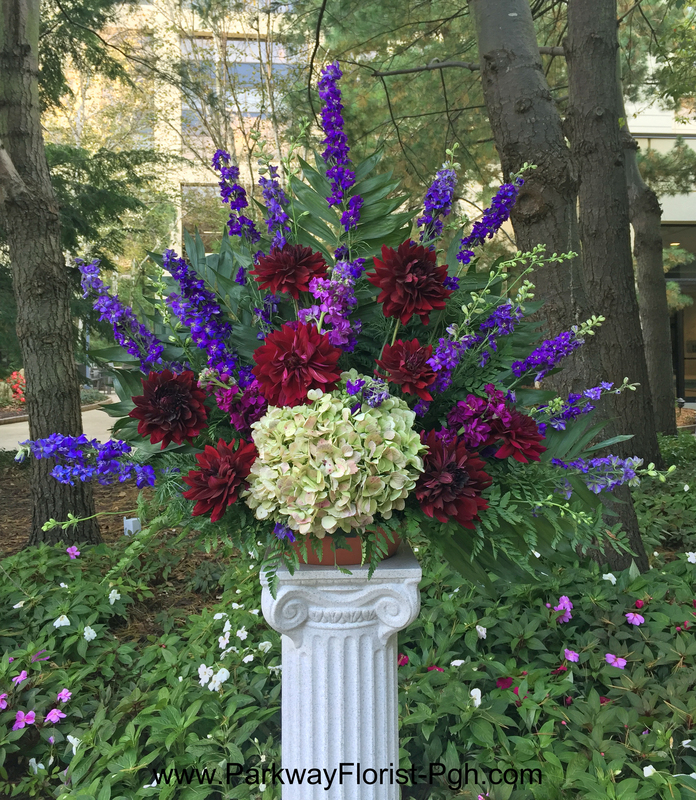 Deep maroon, ivory, and lavender/purple flowers were a wonderful choice for an October Saturday. As always, the awesome ambience of the Omni was gracefully carried forth with the beautiful linens and chiavari chairs. 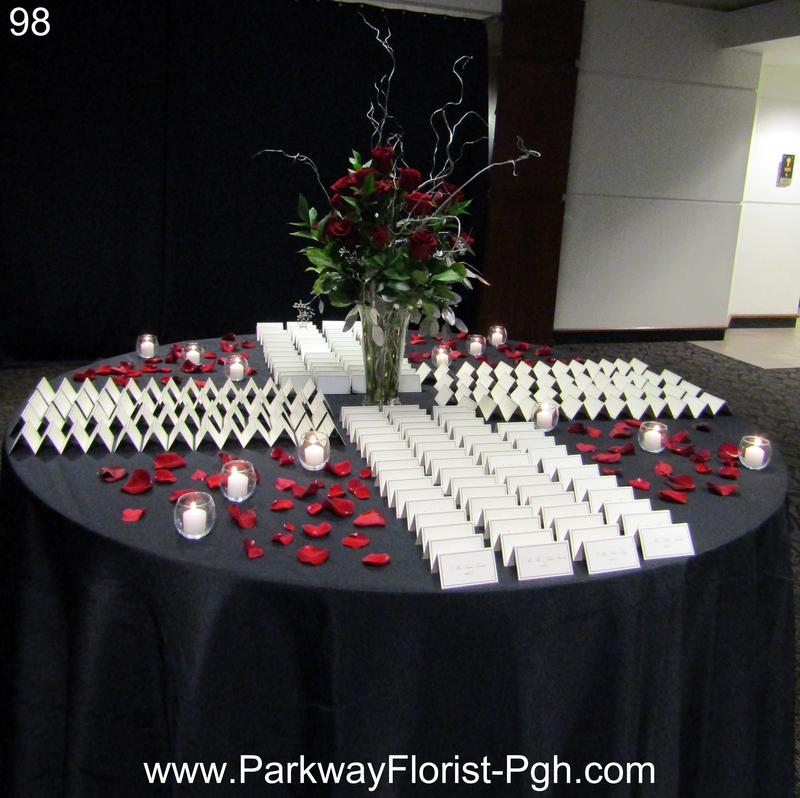 Our final stop was a ceremony, reception, set-up, and coordination at The Pittsburgh Airport Marriott. Midnight blue gowns were complimented by the rich jewel toned mini callas, dahlias, lisianthus, and stock flower. 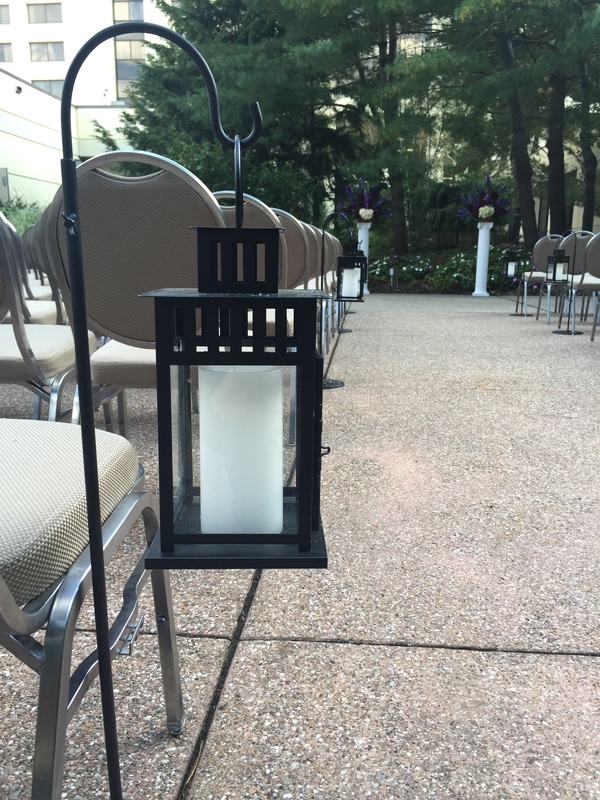 The courtyard was the perfect place for a late day ceremony. The glowing lanterns on the isle were visible as daylight began to fade. All in all, as the last truck headed home, and day turned into night, three more successful weddings were completed. 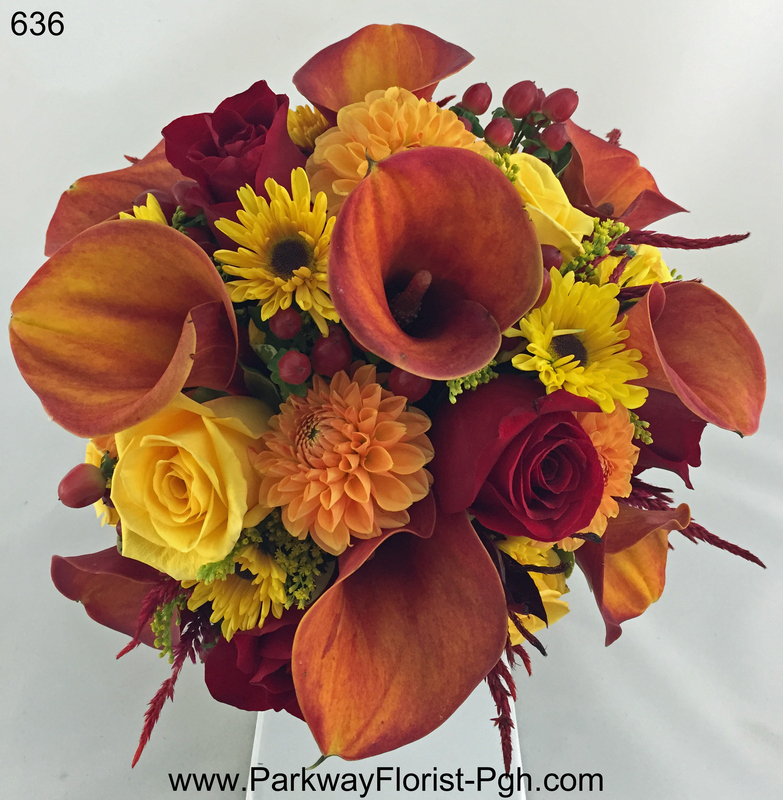 This entry was posted on October 17, 2016, in Weddings - 2016 and tagged fall bridal bouquet, fall bride, fall flowers, fall wedding, fall wedding flowers, maroon and purple wedding, maroon wedding flowers, old st luke's wedding, omni william penn wedding, pittsburgh airport marriott wedding, Pittsburgh Wedding, pittsburgh wedding flowers, pumpkin wedding flowers, wedding flowers. 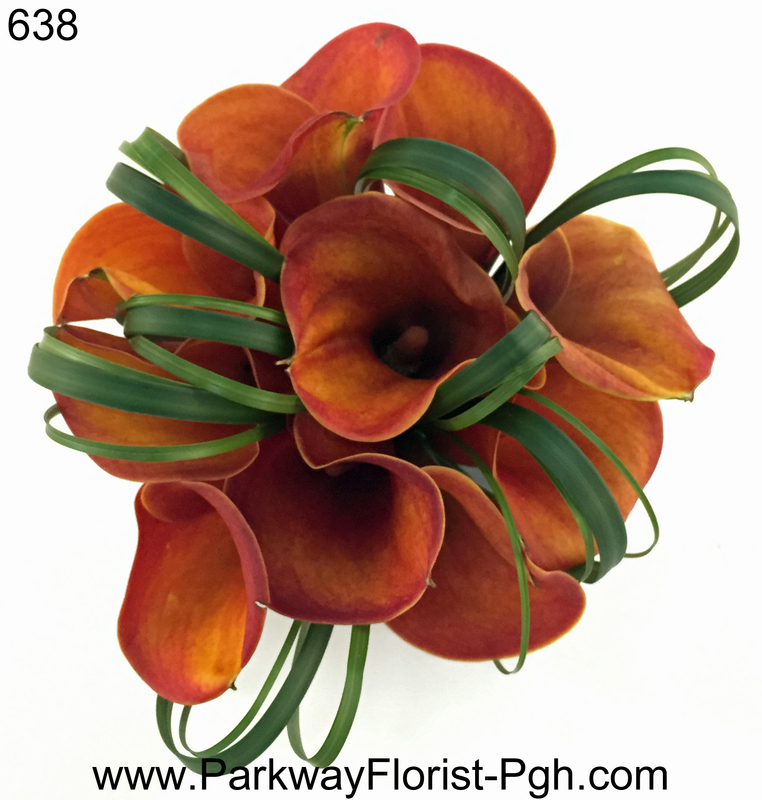 As we always say at Parkway Florist, the possibilities are endless. One of the ways we can honor that statement is by using props that are multifunctional. 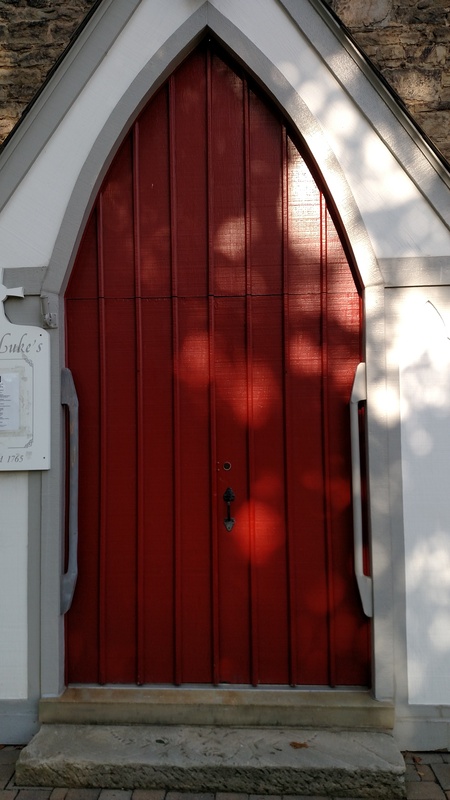 Our brass arch is a great example. 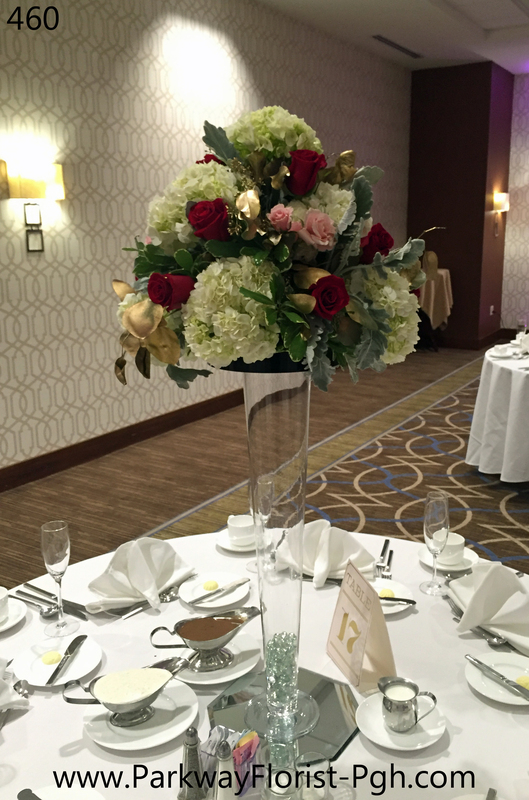 This past weekend we used it for a wedding ceremony that took place at The Pittsburgh Airport Sheraton Hotel. This time we used the brass arch with its complementary tulle and lights. Other times we have used it plain, or with flowers (as you can see here.) This look helped to create a romantic backdrop for the wedding ceremony. Paired with pink up lighting and satin chair covers with gold sashes, the room looked quite polished. The bride carried a bouquet full of rich red flowers as wells as pinks and ivories. 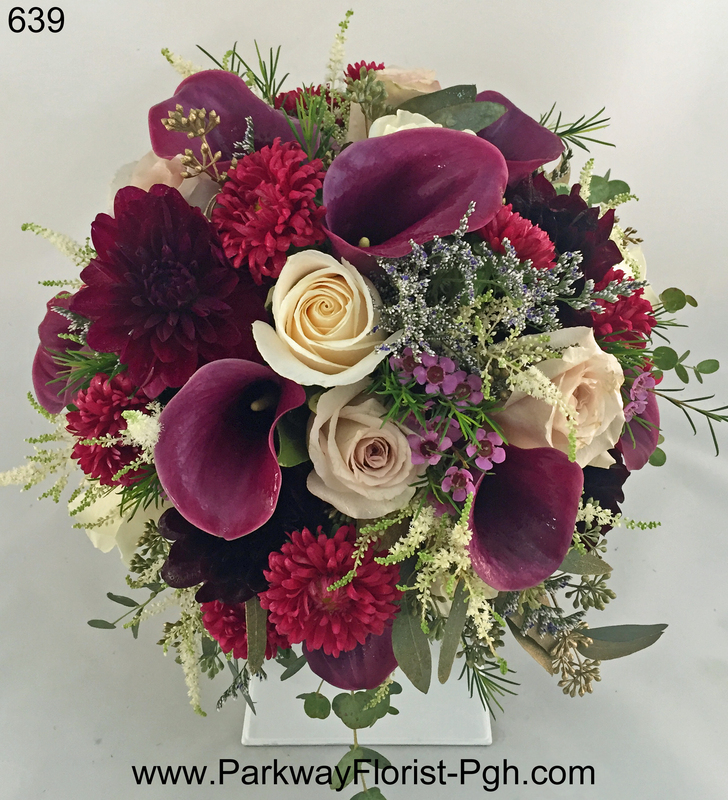 The reds included deep maroon locally grown dahlias and red roses. 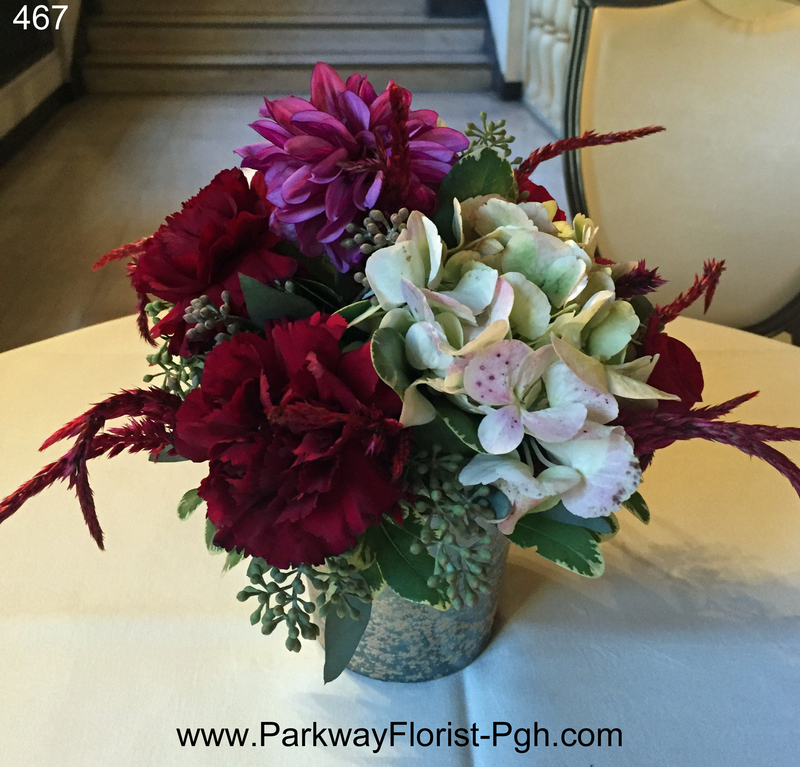 The pinks came from pink roses and dahlias, as well as cockscomb (a type of celosia.) 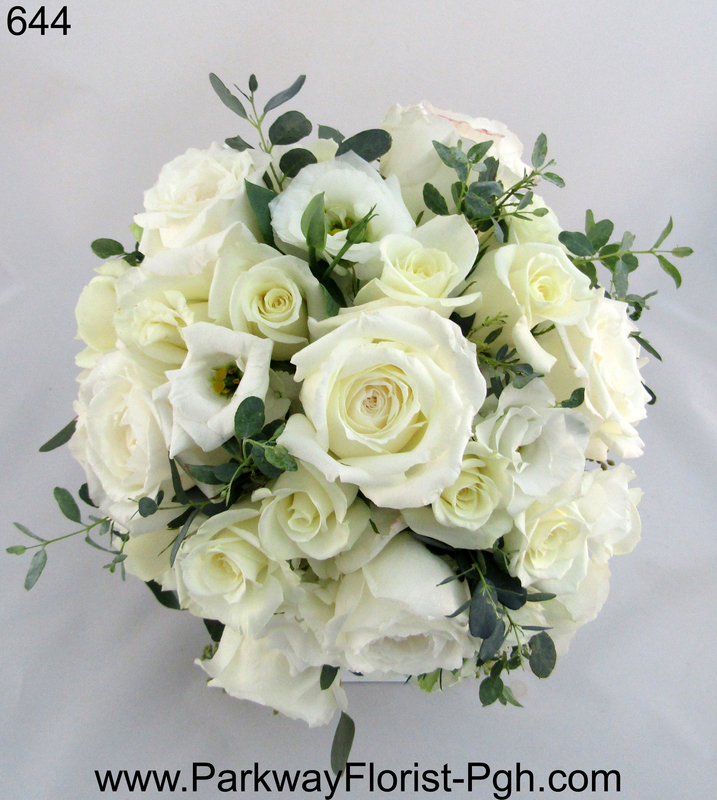 Ivory roses were also included. Lastly, there were gold accents of seeded eucalyptus an a touch of greenery provided by soft dusty miller and gunny eucalyptus. The groom’s boutonniere was made to match. 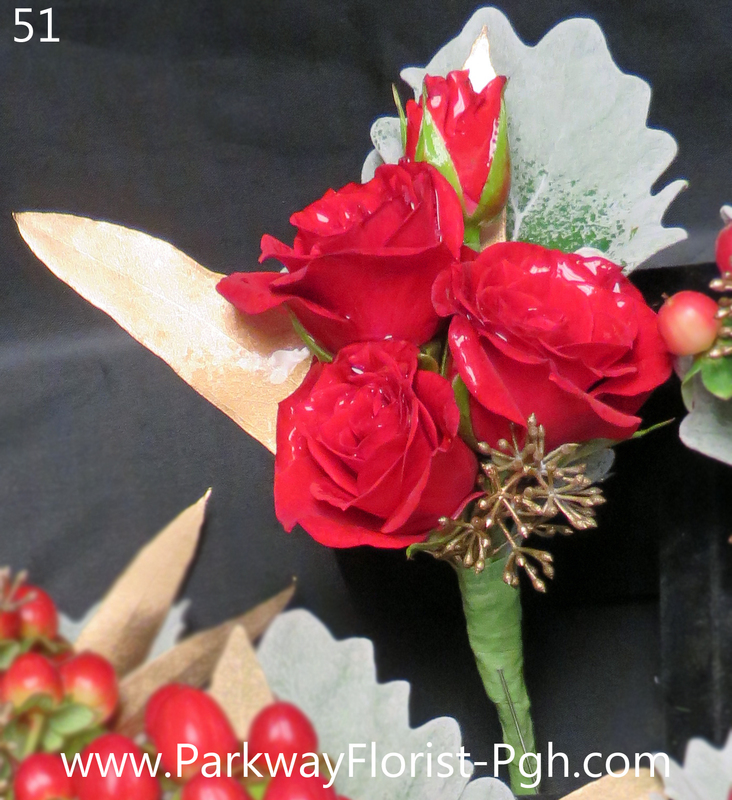 It included red spray roses and gold accents as well. 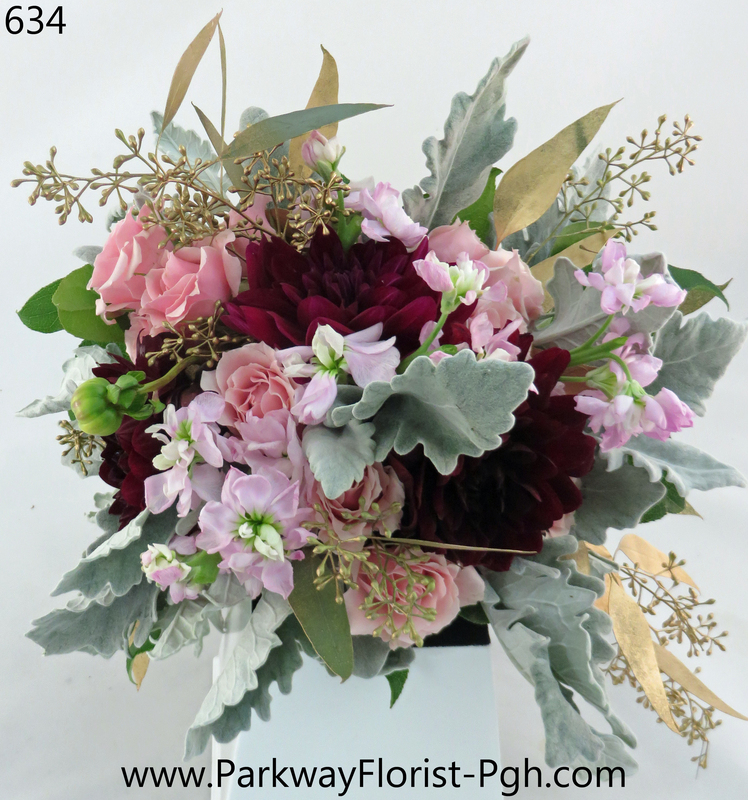 The bridesmaids carried bouquets of deep maroon dahlias, pink roses, stock, dusty miller, and more gold accents. 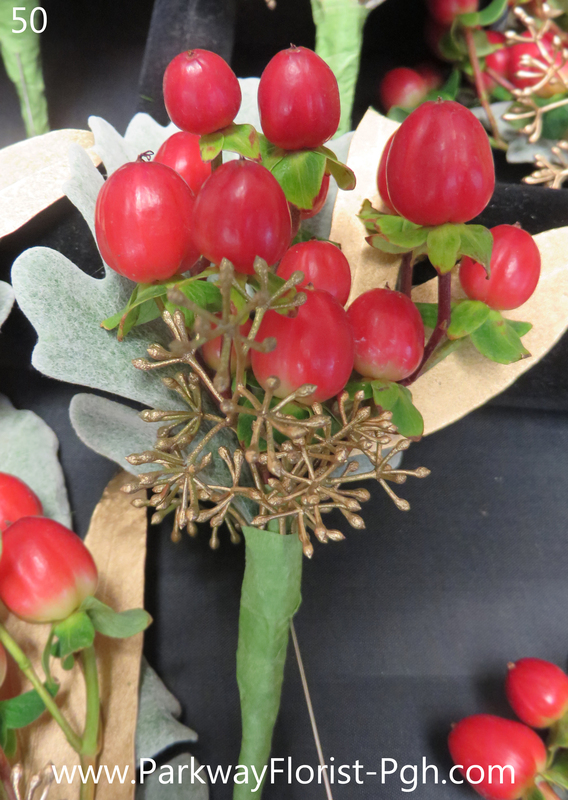 The groomsmen wore boutonnieres of red hypericum berries. After the short ceremony concluded, guests attended a cocktail hour at the opposite end of the hotel. They found their place cards displayed next to a fresh flower arrangement that coordinated with the rest of the flowers used in the wedding. While the guests attended the cocktail hour, the ceremony room was quickly transformed into part of the reception room. The arch was moved behind the head table. Here it continued to provide a romantic glow for the rest of the evening. 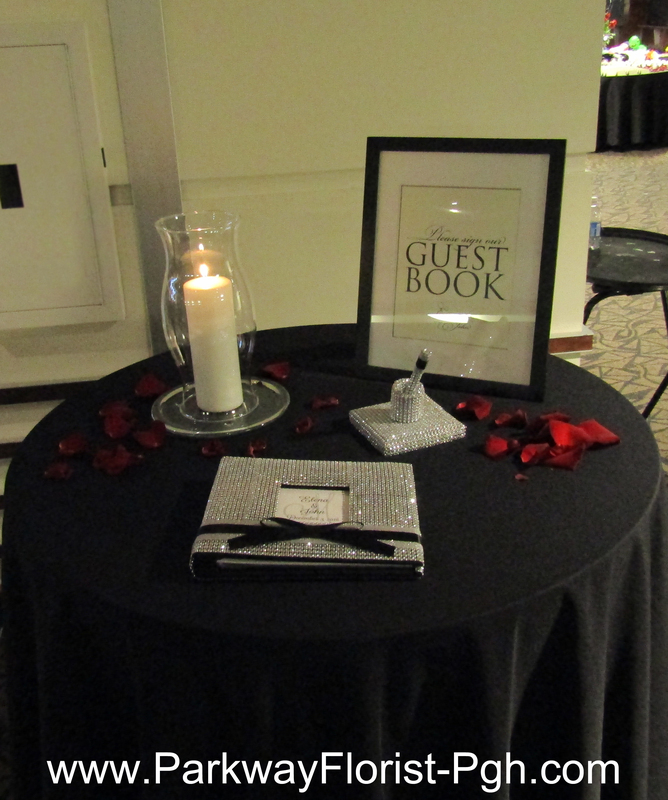 The guest tables were decorated with two different styles of centerpieces. This helps to create interest in the room. The first style were lush arrangements on elevated trumpet risers. They included hydrangeas and roses with gold accents. 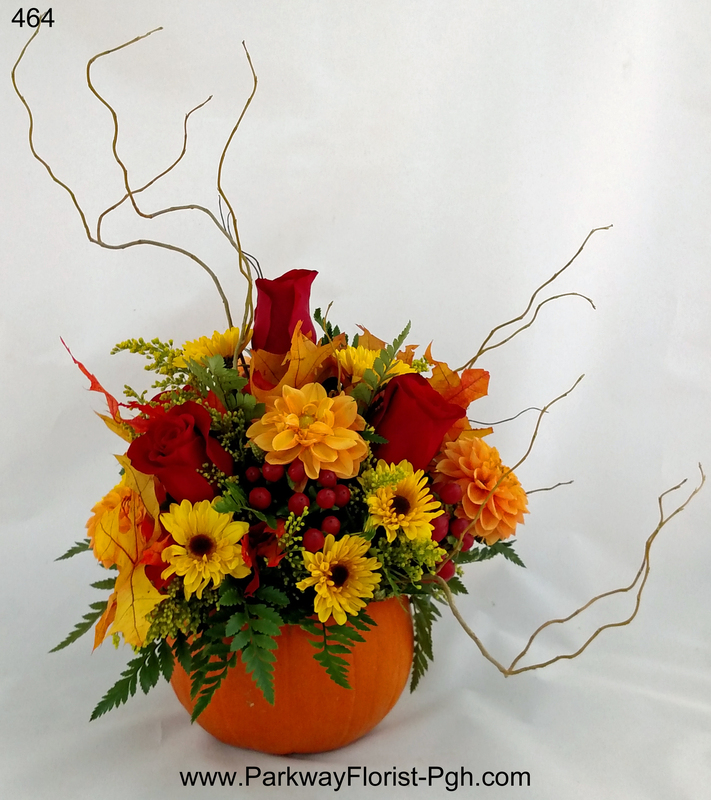 The second style of centerpiece were low on the table. They also included roses and hydrangea. They both used coordinating colors and flowers but with two distinctly different looks. The cake was another place that gold accents were used. 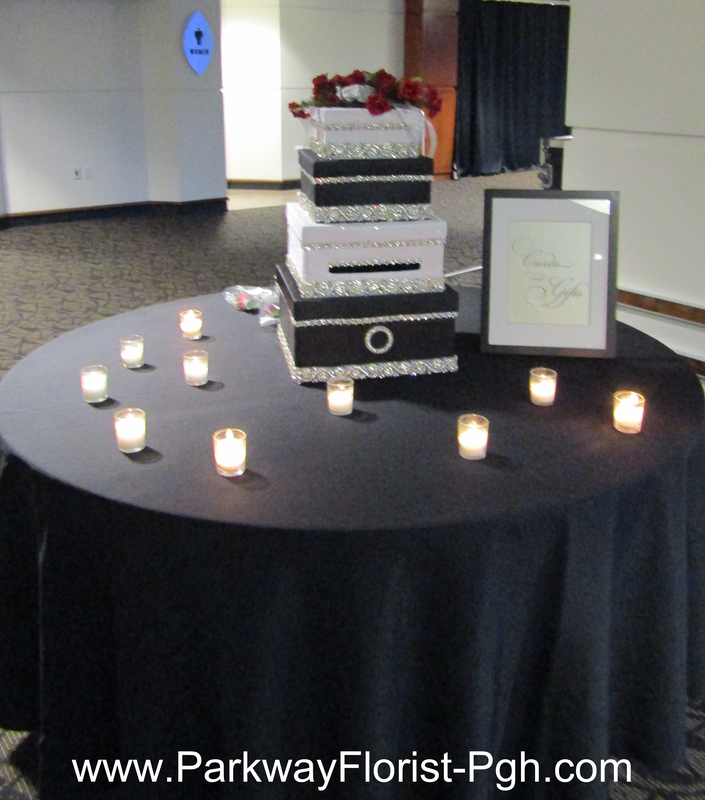 It was decorated with fresh flowers and placed on a gold sequin table cloth for a glitz and glam feel. This wedding was yet another success in our book at a venue that we always enjoy working with! May many years of happiness come to this bride, groom, and their families. 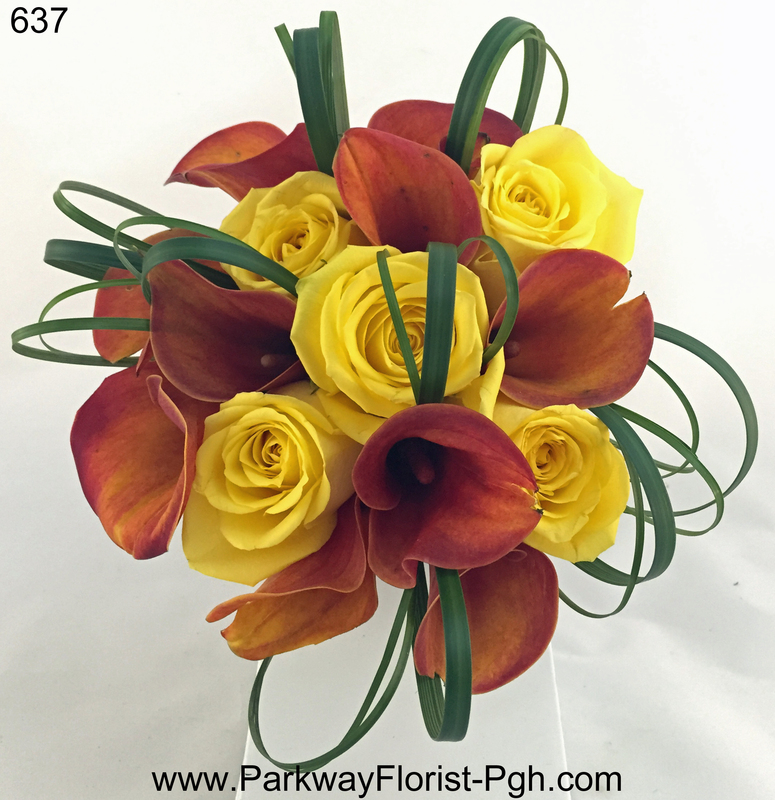 For more pictures, inspiration, and sneak peeks of our flowers visit us on Instagram and Facebook! 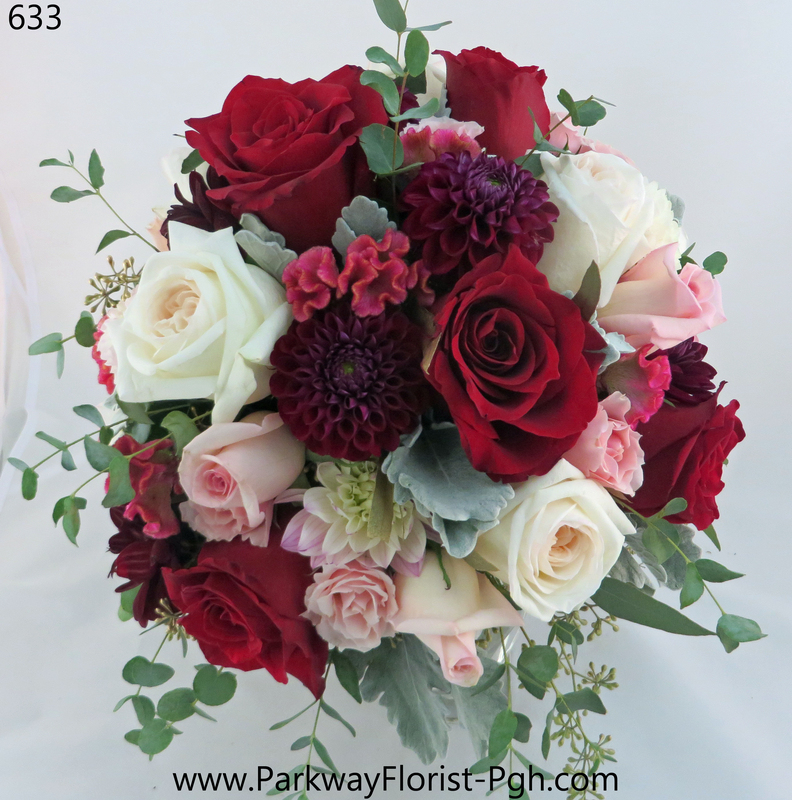 This entry was posted on October 14, 2016, in Weddings - 2016 and tagged bride bouquet, dahlias, hotel wedding, hotel wedding pittsburgh, hydrangeas, pittsburgh, pittsburgh dahlias, Pittsburgh Wedding, pittsburgh wedding flowers, red and gold wedding, red flowers, Roses, wedding, wedding flowers. Pittsburgh meets the Far East! 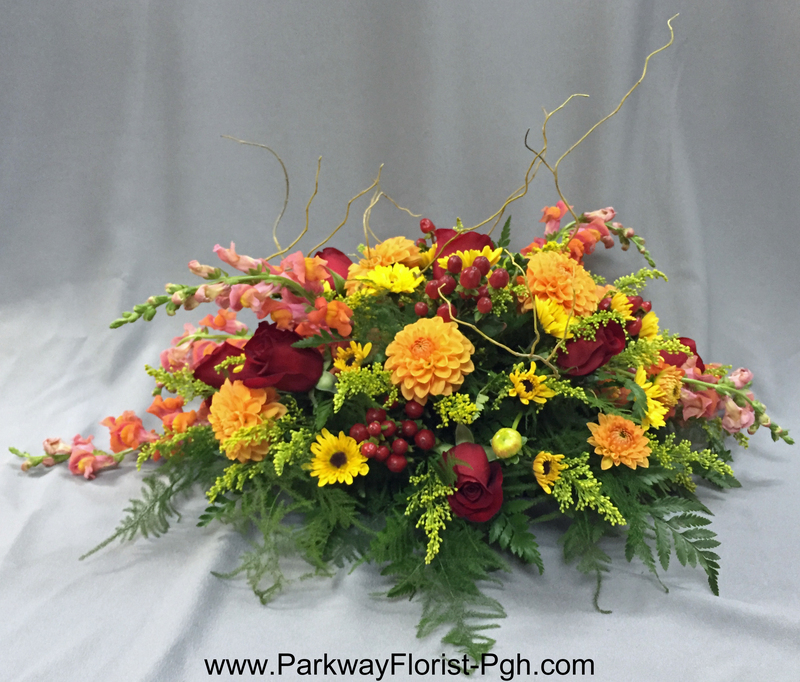 Since Pittsburgh has become a blending of so many cultures, and because we have the luxury of many well known universities and major employers, It is not unusual for Parkway Florist to rise to the challenge of combining our Pittsburgh traditions with those of another culture. Such was the case on Friday, October 7th, when Ming and Kyler tied the knot. Ming is from China. Flowers for the bride can never be all white in Chinese culture, as white flowers are generally only used in death……Pink is the Chinese color for happiness…perfect for a wedding day! So, pink became an integral part of the wedding flowers. 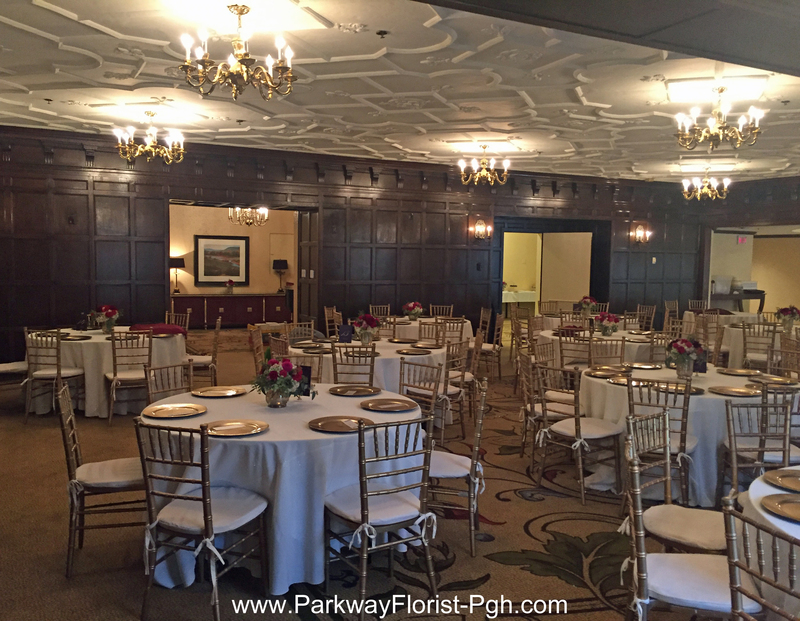 The Renaissance Hotel is one of the many local properties in Pittsburgh that is great for weddings. The hotel has the ability to host both a wedding ceremony and reception. This can be highly convenient for guests. 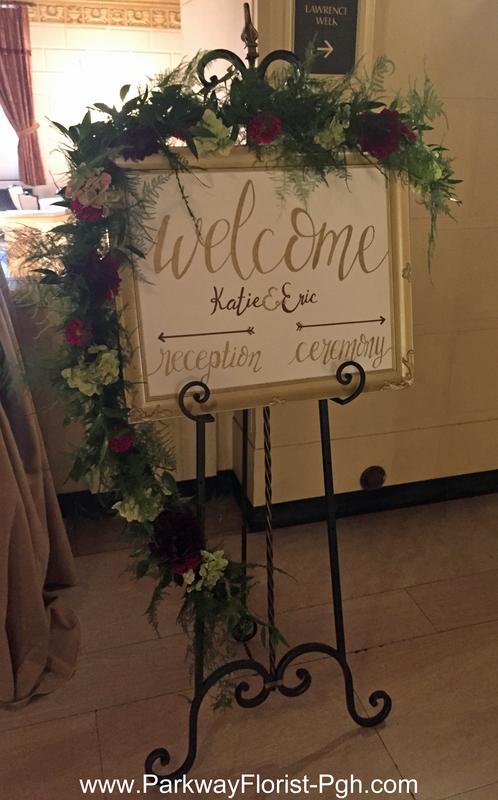 We provided two large arrangements to decorate the railing where the ceremony took place. Combined with the pink lighting the hotel provided, we were set for a pink wedding! The bride carried a classic white rose bouquet with a touch of pink added. The bridesmaids also carried roses, theirs with a bit more color. Lastly, we decorated the cake to match the other flowers we brought. The bride and groom went with a more simple design. Leaving out a cake topper, they opted for a spray of roses and hydrangea which adorned the front of the cake. Every wedding is something different for us, and we are always finding new and exciting methods to make your wildest dreams come true! This entry was posted on October 13, 2016, in Weddings - 2016.